The Progresso Souper You™ contest is over. They have a week to let us know who are the top three vote-getters. So to celebrate the end of the voting I made this looks fancy but scary easy dessert. I wish I could have made one for every one of you guys to thank you for the awesome support you gave me this last couple of weeks. If I am heading to NYC it will be due to all of you. I'll let you know the minute I hear anything. Mix powder into a smooth paste with a little of the milk. 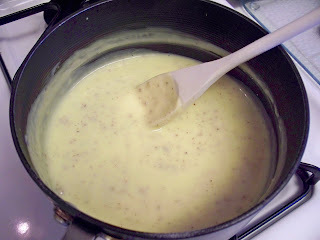 Heat the remaining milk to almost boiling and pour onto the custard mixture. Return the mix to the pan, stir and heat till thickened (it will bubble). Remove from heat and mix Sugar Free Syrup and Almond Meal in. I get my Almond Meal at Trader Joe's it has the best price locally but if you have trouble finding it you can make your own. Just grind almonds with one of these groovy gadgets. FYI: Almond Meal = almonds with skins on, Almond Flour = blanched almonds. Pour into 4 ramekins. I use these. Let cool for a few minutes and top with sliced Almonds. Place in fridge for at least 3 hours to firm. Top with Sugar Free Land o Lakes Whipped Cream. I eat them right out of the ramekins if its just me but if you want to get fancier for company, run a knife around the edge of the pudding and carefully unmold. Last night I served the puddings with macerated strawberries (just chop 1 cup of strawberries and add 1 Tablespoon of either SF Torani Syrup or if you want to get even fancier instead of the syrup use 1-2 Tablespoons of a liqueur (even us weight loss surgery peeps can't catch a buzz on a Tablespoon or so divided over 4 desserts) like Amaretto (Almond), Grand Marnier (Orange), Fragoli (Strawberry), Chambord (Raspberry) and let it soak into the chopped berries for a half hour or so. Super yummy. I cannot wait to see the final results of the Progresso contest! I loved going to vote each day to see where you were on the graph! FUN!!!!! 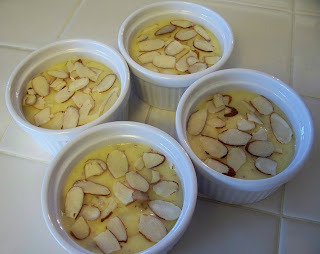 I have been having major custard cravings and don't care for my recipe...never gets set in the middle (or if it does, it's tough around the edges). And I cannot find the custard powder you use. Anything else or another brand you've used? ((hug)) good luck! I really hope you make it to NYC! @Di Try an imported food store... it's a British product. I have seen it on occasion at Cost Plus World Market too. Another thing... though I am a soy milk girl.. soy milk & puddings do not mix (they will never set) I use regular milk (2%) for this type of dish. Cooking milk tends to limit the lactose issues I have. I was going to make a mini meatloaf tonight too... changed at the last minute to a casserole. It's on my menu this week. Hope you enjoy it! I couldn't agree with Jennifer more. She said it perfectly. Can't wait to hear the results. I voted every day! You HAD TO be the top vote getter! Your amazing and so deserve to win! I was just cooking with my boss (we're making your fruit and nut chicekn salad) I had this BRILLIANT idea! You should start a Eggface Intervention - - and come and teach people to cook like you do. I know my ad agency (we're small and LOVE to eat/coook together!) would LOVE LOVE LOVE LOVE that! We just started a recipe section on our company website: hellodsa.com and don't be surprised if some of your recipies are posted there! Maybe we can convince you to stop by Scranton, PA while you're in NYC!! Oh, one other quick story - -last night I was making your Fruit and Nut Yogurt before I went to bed (for breakfast this morning), and I'm standing in the kitchen and take one bite and go "MAN I LOVE THAT WOMEN!!!!" My roommate turned to me and goes "What'd you make now?" so I told her and she goes "Eggface is your Martha Stewert!" hehehe. Hi Shelley - Good luck with your contest! I have a feeling you will be going to NY. 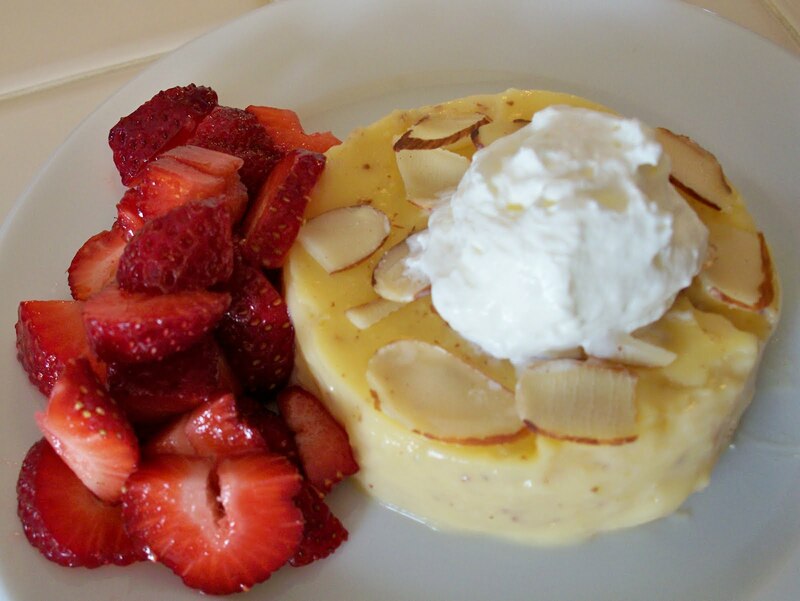 Question: I am wondering if you have tried the Silk Almond milk in any of your recipes? I can't drink regular milk and sometimes have trouble with soy. The almond seems to work better, but I have wondered if it could be substituted for the soy or regular milk in most recipes? Thanks for posting all of the great recipes! I come here for ideas a lot. Martha demon possesses me on insomnia nights and makes me make stuff. LOL. Carol, I haven't tried the Silk Soy Milk yet. I tried other brands and wasn't a huge fan of it taste wise. This would be a perfect recipe to try it on though... not sure whether almond milk sets up for puddings but please let me know if you test it. If it doesn't set... dump it in the blender with a scoop of protein and make an almond shake. No waste. Good luck - but I'm sure you won! Every time I checked/voted, you were waaaaaaay ahead. You'll have so much fun, and we'll have fun vicariously with Ms. Vicari (did I spell that right?). Go Eggface, go Eggface! !